Tag Archive | "Cedar Trails Elementary"
The Cedar Springs Kindergarten Team welcomes the parents/guardians only of the 2015-2016 Kindergarten Class. Parents/guardians will move in small groups from classroom to classroom getting a glimpse at the typical kindergarten day and curriculum expectations. There will be five stations in all. We are hoping to answer questions and get EVERYONE ready for an exciting start to the school year. In August after teacher assignments have been finalized, we will welcome the students to Cedar Trails’ Open House to visit their classroom and meet their teacher. 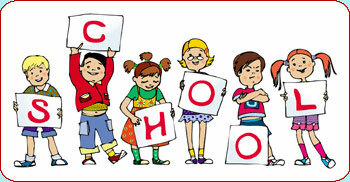 2014-2015 School Year Kindergarten Pre-Registration for children turning 5 years old by October 1, 2014 is now open. For more information, call 616-696-7317 or visit www.csredhawks.org. The Cedar Springs Kindergarten Team invite the parents/guardians of the 2014-2015 Kindergarten Class to a special evening at Cedar Trails Elementary. In August, after teacher assignments have been finalized, we will welcome the students to Cedar Trails’ Open House to visit their classroom and meet their teacher. March is reading month—which means it’s time for all first graders to get a chance to sign up for their very first library card. Cedar Springs Public Library and KDL’s Sand Lake/Nelson Township Library team up to visit kids at school and get them excited about this new privilege. 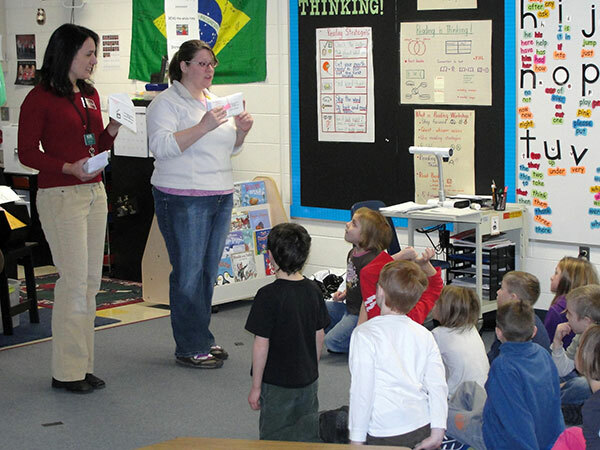 Shannon Vanderhyde, Youth parapro at Cedar Springs, and Sara Magnuson, youth parapro at Sand Lake/Nelson Township, recently visited 11 first grade classrooms at Cedar Trails Elementary, and one at Creative Technologies Academy to hand out the envelopes with information on what to do. Algoma Christian will also receive a visit this year. The cards are good at any library in Michigan. To celebrate, all first graders get to attend a movie March 3 and 4 at The Kent Theatre for free, with other family members welcome for $3 each. The movie is “The Nut Job.” Doors open at 5:30 with the movie starting at 6:30. A child’s library card or family library card entitles the first-grader to a free small popcorn that night. Just present your card at the concession stand. 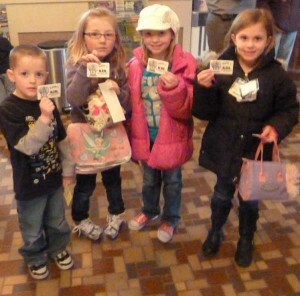 Four happy first graders show off their library cards at the Kent Theatre. 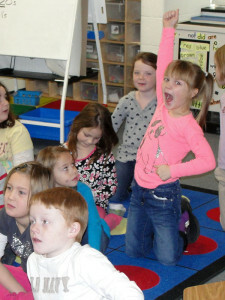 In what’s become an annual event, first graders at Cedar Trails Elementary and Creative Technologies academy were invited to celebrate “March is Reading Month” by getting their library cards. This is the 15th year of the event. Cedar Springs Public Library Director Donna Clark visited Creative Technologies Academy to hand out envelopes with special invitations to 20 first graders and families of Mrs. Presler’s class to get a new library card. Shannon Vanderhyde, Children’s Parapro for the Cedar Springs Public Library and Sara Magnuson, Children’s Parapro for Sand Lake/Nelson Township Library and Kent District Library presented the special invitation letters to the 11 classes at Cedar Trails on February 22, which included about 270 students. All students who registered for or already had a library card were invited to see a special showing at the Kent Theatre of “The Adventures of Tin Tin” on Monday and Tuesday this week. About 212 first-graders and family members attended the event. Cedar Springs children’s author Amanda Litz was on hand to raffle off three books each evening from her “Sam and Pam can and you can, too” series. 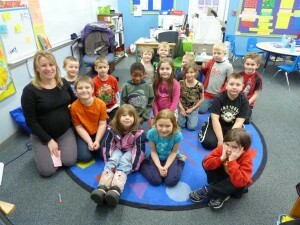 Mrs. Presler’s class at Creative Technologies Academy were happy to be invited to get their library cards. Clark said they are appreciative of their partnership with the Kent Theatre in this endeavor. “It’s really great to have a theatre in your own hometown,” she said. Clark also paid tribute to Cedar Springs resident Mike Metzger, who started the annual drive. “The library card drive began all those years ago because Mike Metzger had a dream and a passion to see that every child in the first grade had a better chance of becoming a proficient reader early on. It was his idea to start a Library Card Drive through the Library, and he is as passionate today as he was then,” she said. 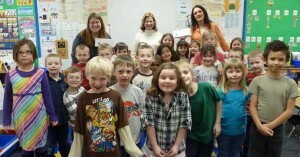 Mrs. Sendler’s class at Cedar Trails were also happy to be invited to get their library cards. 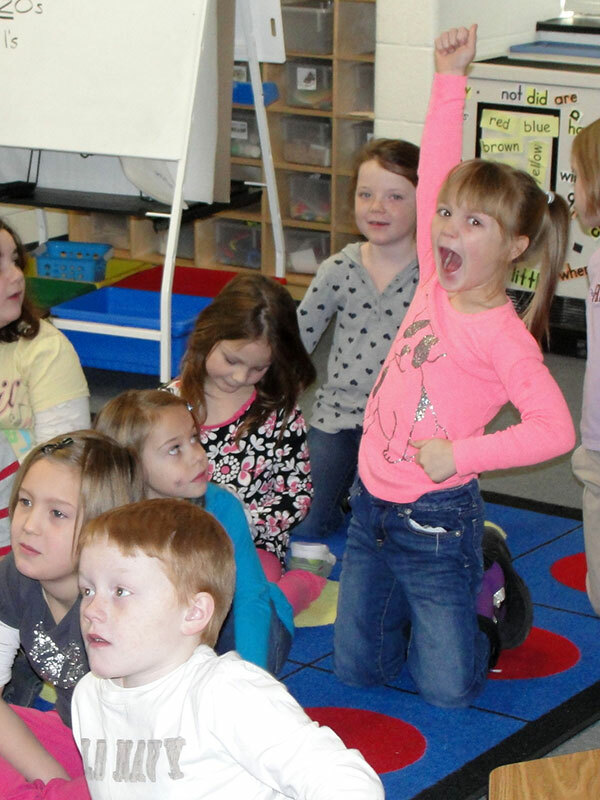 These children in Mrs. Dault’s Great Start pre-k classrooms at Cedar Springs are having fun while they learn. While many state programs face funding cuts, Michigan’s pre-k program is getting some help this year. After seeing its funding cut by 7 percent last year, the Great Start Readiness Program is slated for an increase of 5 percent, for a total budget of almost $99 million. That’s good news for Cedar Springs Public Schools, who offers the grant-funded program to residents of the school district who meet eligibility requirements. Cedar Springs is eligible for $163,000 to cover the costs of the program, which has enabled more four-year-olds to participate. “We were able to up the number of seats available from 24 to 48,” explained Superintendent Ron McDermed, at the Board of Education meeting Monday evening. Cedar Trails Elementary has two Great Start pre-k classes, with one that meets all day on Mondays and Wednesdays, and another class that meets all day on Tuesdays and Thursdays. Both are taught by a certified teacher and teacher assistant. The program is designed to provide four-year-old children with the skills they will need to be successful in school when they enter kindergarten. According to a new study by Pew Center on the States, Michigan is one of 15 states to increase funding for the coming year. Marci Young, Pre-K Now campaign director for Pew, says legislators are listening to research showing that pre-k programs make a big difference, especially for children most at risk of being behind when starting school. She used Detroit Public Schools as an example. “A study that was done in Detroit preschool programs in 2004-2005 showed achievement growth in cognitive and behavioral skills that was demonstrated by all students who were enrolled in Detroit Public Schools through their pre-k program,” she explained. Michigan also changed its eligibility criteria for the Great Start Readiness Program to include children from households that are up to 300 percent above poverty level—that’s the highest in the country. Young applauds the state legislature, and says restoring some of last year’s cut is a good investment. “To ensure a prosperous economic future, states are going to have to make sure that they invest in successful, evidence-based programs that are proven to yield the strongest return on the investment. And pre-k is one of those smart investments,” noted Young. The additional funding also includes a provision that stops school districts from diverting pre-k money for general education expenses. Twenty-six states managed to either protect or increase their pre-k funding, no matter which political party was in power. 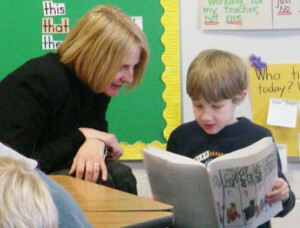 Pew calls that a clear message that early learning is seen as a valued strategy for education reform. The report is available at www.preknow.org/votescount/.